I'm Arunima Sen, a high-school student from India. I'm currently an 11th grader from Bangalore. I aspire to pursue engineering after I graduate from highschool. To come to the main thing for which I'm writing this, my father is a patient of chronic depression and hasn't been able to attend office regularly for the last few years. Along with depression, he met with an accident due to which he got diagnosed with spondylitis and slip disc which further proved a hindrance to him for attending office. We are making our ends meet from a meagre amount of monetary loan received from my father's office. My mother was a contractual teacher whose contract ended back in March. I also have an elder autistic sibling who is undergoing expensive treatments and medications. 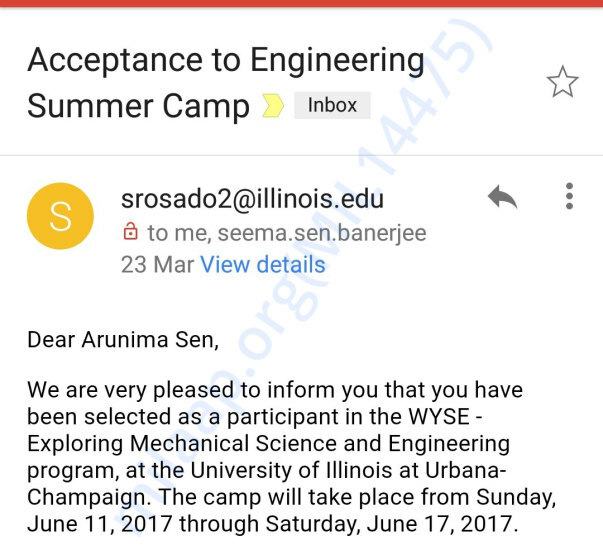 I got accepted into a summer program called the "WYSE: Worldwide Youth in Science and Engineering" conducted by the University of Illinois, Urbana Champaign for the Mechanical Engineering Program. I'm really very interested in attending this wonderful program because I want to become an engineer someday soon. The summer camp is very significant and will develop in me valuable skills that will be vital for achieving success. The only problem is that I cannot afford this program. Given a chance, I'd definitely attend the program. Recently, I had been selected as a Junior Researcher at the Junior Academy of the New York Academy of Sciences. Over 8 months, I worked on 2 projects, namely Determining Micronutrient Deficiency using Spectrophotometry and a Solar Hybrid Bus which had the latest forms of technology embedded in it to make the world a better living place. My second project had been selected for the final rounds for which I received a travel scholarship and visited New York city the last week. At the event there, Nobel Laureates, CEOs and Eminent Scientists who had presided over were very impressed by our project. 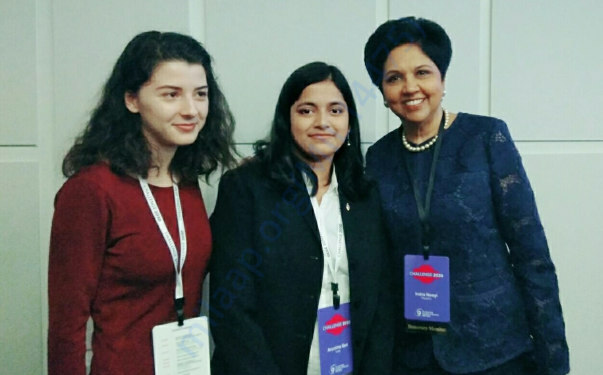 Particularly, Mrs Indra Nooyi CEO of PepsiCo complimented us for our project. Back in India, many people felt proud of me as I had represented India at a Global Platform. I promise to repay the debt one day when I'm established on my own feet to the needy ones like me then. I'd be highly grateful if you can contribute some part towards helping me to achieve this dream. I'm really indebted to all of you for having contributed a lot as per your capacity towards my fundraiser campaign which would help me to attend the prestigious WYSE (Worldwide Youth in Science and Engineering) held at the University of Illinois, Urbana Champaign. Unfortunately, I couldn't be able to attend the program this time due to lack of funds and other resources inspite of your generous consideration and contribution. Since I wasn't able to fulfill my aspiration, I won't let your hard earned money go waste. No one better than me realises the true value of money as I've been constantly facing economic, financial, educational and health constraints. Had my family been in a good position today, I could've been able to fulfill all my aspirations. Though I was very enthusiastic about attending the program, I have no regrets about not being able to attend it albeit your and many other people's moral and financial support. I believe in the saying - "Whatever happens, happens for good. You may not realise it now, but down the road, you will". Though I feel crestfallen and dejected, I do hope the Almighty provides me with more avenues and opportunities in the future to prove my potential and worth. My heartfelt apologies to you for having persuaded or even pestered you to help me out. I'd be really happy if in any way I can return you your hard-earned money back. If you’d like a refund, please write to me using ‘Contact the Campaign’ organizer option on this campaign page. I have withdrawn the funds from the campaign- so the Milaap team will not be handling the refunds. Don't worry, your personal details will be safe with me. Thanks for your dear donations. 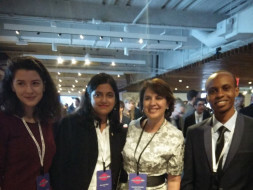 I started this fundraiser campaign to manage funds to travel to the US for a summer program. The summer program starts on the 11th of June. I'm withdrawing this money to book my tickets. I wish you the very best to achieve all your dreams, Arunima! Jai Hind! All the best arunima. Make your parents proud. India is blessed with talents like you.